Friday night, June 1st. Wind’s up! 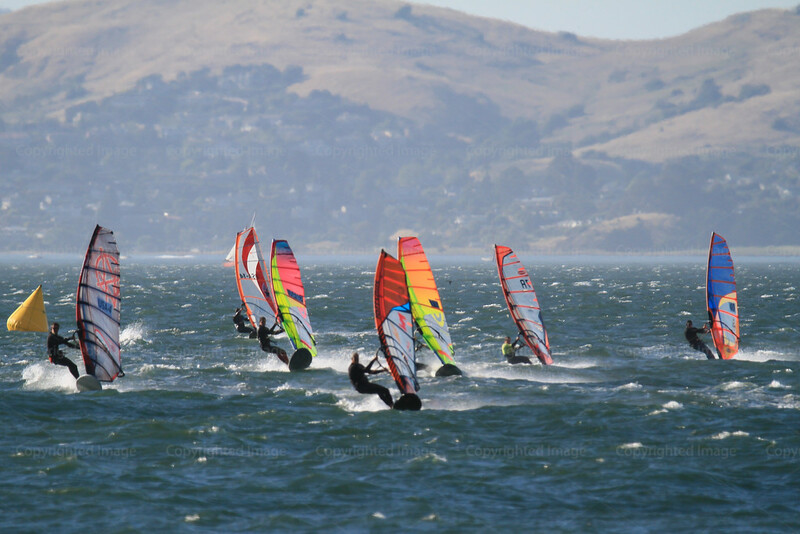 We blaze into the 2nd night of the St. Francis Yacht Club summer slalom series with 14 boards on the line. I’m out of practice but well lit on the custom Mikes Lab 70 cm slalom board, 7.6 Avanti membrane sail and 42cm Z fin as the building ebb & sea breeze pump through the Golden Gate and down the San Francisco city front. This year, we are trying a new format to increase participation & minimize club logistics. We set one mark half way down between Crissy Field & the St.FYC & use two of the fixed marks in front of the club. The starting line is just off the beach & the finish line off the race deck. It’s a civilized series, where you can stand at the water’s edge ’til one minute before the start and still make the pin end of the starting line. Two and a half minutes & four high speed gybes later, it’s all over and we line up to do it again. There are five races a night with one throw out & your best three out of four nights count for the season. The easier format draws a few sailors that we might not have otherwise convinced to come out and race while keeping the speed freaks happy with the longer reaches. The RC has to set one mark and a starting line & two volunteers on the race deck are needed for finishes. Beers after, or between races – your choice! I take a few practice runs before the start and realize it’s going to be a pretty heady first reach with three to four feet of voodoo chop, breaking swell and 18-22 knots of breeze. I nail the first start at the pin, breaking out from the pack and immediately enjoy clear air down the first leg. The first gybe is hairy with the pack just behind me. I keep it together and lead the fleet to the A buoy. ‘Wide and tight‘ is the rule for mark roundings as I approach mark two and close the door on the guys trying to sneak into what’s left of a loud hail of “NO ROOM!” The usual suspects go down as Jean Rathle and Soheil Zahedi are left swimming. I make it around two more blazing reaches and get the first bullet of the night. Race 2: Wind’s up even more with puffs closing in at 25 knots. There’s some confusion at the start with a late horn but I send it with my back foot firmly planted in the leeward strap for control down the first reach. Local wizard, David Bernsten puts it into overdrive, making the most of his narrower Mikes Lab slalom board and flying right over the top of me. He keeps up the pressure the whole race, not letting up a bit and grabs his first bullet of the night while I stay in 2nd. Race 3: Zahedi and Rathle are on a mission – getting a clean start and leading the pack. I’m in a close third, looking for any opportunity to take advantage of their mistakes but their smaller boards give them a real advantage on speed. My gybes are clean but not enough to make up for the difference. Rathle puts the pressure on the last leg and reduces the distance ’til he and Zahedi are overlapped & flying 25 knots toward the finish line. Zahedi just edges him out. I settle for 3rd. Three races so far & three different winners. This is going to be a tight night of racing! For the full story – head over here. Next story Maui slalom secrets: time your starts and dodge turtles! Previous story Going the Extra Mile in the Outer Banks!